Sitting Chan, Drinking tea in a Chan way, walking Chan....according with Buddha's teachings. We are waiting for you. For all information you can contact us: info@unidharma.it. If you are interested we will send you the application form to fill. The practice of Chan is essentially quite simple and is based on the so-called sudden method, derived from the Buddha Shakyamuni and passed on to us from Master to Master through centuries to this day. This practice is, in fact, the most direct and profound approach of the entire Buddhadharma. These ultimate realization principles are applied to everyday life, every 24 hours, in any situation, and this retreat is no exception. The practice includes sitting meditation, walking, simple physical exercises, work assignments, explanations of the principles of Buddhadharma, etc. True and genuine realization cannot be separate from our life experience. The retreat is open to all practitioners with at least some meditation experience, and will be led by the Chan Master Venerable DaXing. There " The wind of the west keep blowing "
In a solitary lodge in the middle of the forest a real buddhist monk elucidate the ancient teachings passed down generation to generation from the Buddha through many many Patriarchs till the present days . 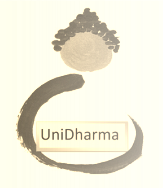 UniDharma association organize all kind of levels retreats and others activities suitable to all practitioners.
" When the mind has let completely dissolve all the ignorance the real enlightenment is manifest ! expert Master they can ultimately have a genuine realization. ​The practice is simple and people can surprisingly realize how smooth is possible walk on the Supreme Path ..
May all sentient being realize their inherent Buddhahood and keep helping all others beings! " Chan monk Da Xing ! Our meditation meditation retreat took place. Nine days of practice by exploring the huatou method. During this time, thanks to the guidance of Master DaXing, it was possible to train the mind to practice the method not only when sitting in the tranquility of the room or in a meadow, but especially while performing various activities. So, the deep question (huatou) was repeated during walking along the paths, during house cleaning, garden cleaning, wood harvesting and cutting, during meal preparation, etc. A good exercise, accompanied by the harmony of being with new people coming from London, Singapore, Beijing, Berkeley, Bern, Cremona. Together we shared intense and unforgettable moments. ​Withdrawals are followed by precise tables for jobs and assignments. Schedules planned by Master DaXing are essential to allow for better retirement success. One of the characteristics of the retreat is silence. This, which may seem like a rigid rule to apply, is actually crucial to allowing each participant not to be distracted by others from the huatou practice. That is why these tables are written in various parts of the house on which the schedule of practice and assignments of participants within the group are written, in order to allow for a harmonious collaboration between the practitioners. For each activity, a leader is set up: the task is assigned to practitioners who have long been involved in retreats and who know better about the dynamics and the place, so they are more willing to maintain the order of the equipment used, Of the dishes and so on. Almost every day the Master shows a meeting with the leaders; These meetings are intended to best monitor the performance of the various activities as a result of observing individual needs or assembly. Outside activities take on several facets: meditative slow walking, meditative walks in the woods with the reach of places to practice, sitting on a trunk or near a river, observing nature and all phenomena with the use Of the senses without the involvement of the self, but also gardening, cutting, transporting and rearranging the wood, cleaning the local trails with racks and scope, cleaning the outside of the structures such as gearboxes, horse stables, home. Respect for the rules by all the participants, consistent with choosing to participate in a CHAN retreat to deepen a path of spiritual growth, has also made this a very successful retreat.